We are conveniently located in the medical professional building located on the Emory Eastside Medical Center campus. We have recently renovated our offices and all patients can now be conveniently seen on the first floor in Suites 110 and 150. When you call to schedule an appointment, you will be directed to the appropriate suite for your visit. Lunch break is from 12:30-1:30 PM at which time the answering service responds to all phone calls. The phone lines open again at 1:30 PM and close at 4:30 PM. The answering service is available at any time the phone lines are off. Appointments are available seasonally. As of August 11th, 2018, Snellville Pediatrics, P.C. will be offering Saturday office hours! Please call our scheduling department for more information. In case of emergency, please call 911. You can reach our answering service at 770-985-7966. 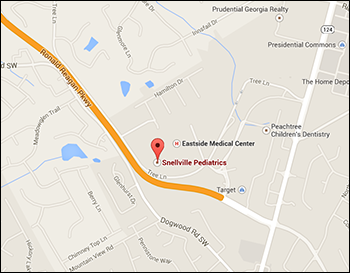 Snellville Pediatrics is closed on Sundays.